TORONTO, May 9, 2012 /PRNewswire/ - Abbott today announced that its new FreeStyle InsuLinx Blood Glucose Monitoring System1 is now available in diabetes centres and select pharmacies across Canada. It is the first blood glucose monitoring device in North America that offers a mealtime insulin calculator for calculating suggested insulin doses. The FreeStyle InsuLinx System is designed to offer suggested insulin doses, as well as other features specifically intended to assist insulin-using patients in more effectively managing their diabetes. The user-friendly features include a touch screen interface, automated logbook, personalization preferences, and USB connectivity for plug-and-play reports. "Insulin is a very important medication in the management of diabetes. While one of the most understood drugs available, if insulin is not dosed properly it can lead to serious consequences, most specifically hypoglycemia. Fear of hypoglycemia leads to hesitancy to follow suggested insulin dose adjustments for both patients and health care providers," said Lori Berard, RN CDE Nurse Manager at the Health Sciences Centre Diabetes Research Group Clinical Research Program, affiliated with the University of Manitoba. "Some health care professionals are reluctant to prescribe insulin and/or intensify treatment as they are concerned that errors may occur when their patients are self adjusting their insulin. For people living with diabetes, they are often hesitant to self adjust. It is encouraging that a product is available that may potentially assist some patients in their diabetes management. This could provide additional confidence for providers around proper insulin dosing to ensure patients are receiving the most effective therapy for their individual needs," said Berard. The FreeStyle InsuLinx Blood Glucose Monitoring System is compatible with the FreeStyle Lite blood glucose test strips with ZipWik tabs5 which are designed to offer easy blood application, resulting in a better blood glucose testing experience for people living with diabetes. Individuals with diabetes who are interested in the FreeStyle InsuLinx System should consult with their healthcare professional. This system is now broadly available at diabetes centres and select pharmacies in Canada. "We're pleased to introduce the FreeStyle InsuLinx Blood Glucose Monitoring System in Canada in an effort to assist with the day-to-day challenges endured by individuals with diabetes who use insulin," said Todd Nelson, General Manager, Abbott Diabetes Care Canada. 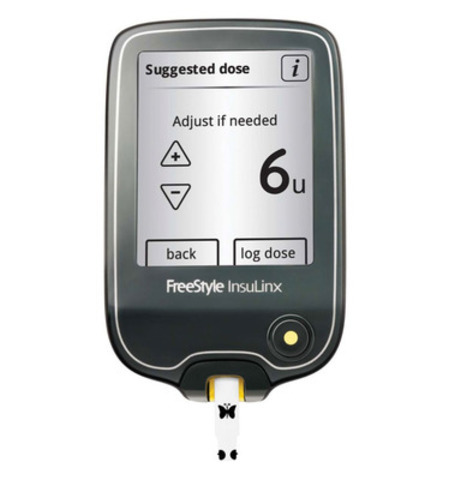 "The FreeStyle InsuLinx Blood Glucose Monitoring System is the first innovative system in North America offering insulin calculation technology and new features specifically designed for insulin-using patients. This is a significant advance for the many patients in Canada who may benefit." Abbott has been operating in Canada since 1931 and its Canadian operations are headquartered in Montreal, Quebec. Abbott Canada employs more than 2,000 people. Abbott's news releases and other information are available on the company's Web sites at www.abbott.ca and www.abbott.com. 1 FreeStyle and related brand marks are trademarks of Abbott Diabetes Care, Inc. in various jurisdictions. 4 Leger Marketing Survey Data. Fleishman-Hillard's Diabetes Study. September, 2011. 5 In Canada, the FreeStyle InsuLinx Blood Glucose Monitoring System is compatible with FreeStyle Lite blood glucose monitoring test strips with ZipWik tabs.